Low Carb Shrimp & Noodles! 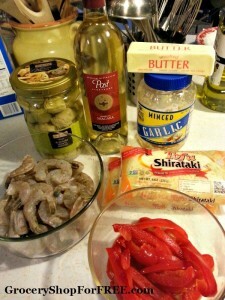 You are here: Home / Recipes / Dinner / Low Carb Shrimp & Noodles! When you are working hard to lose weight eliminating any food from your diet helps but one of the most popular ways to lose is by limiting your carbohydrate intake. 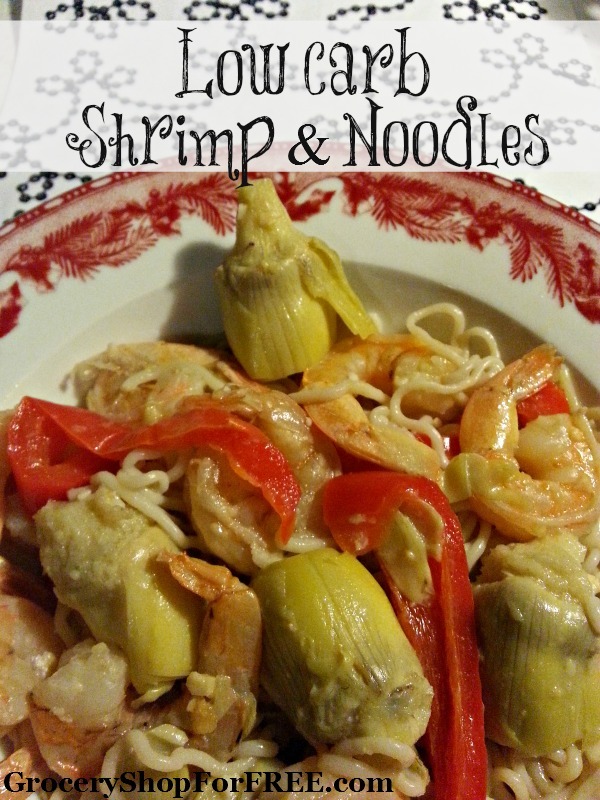 I miss my pasta but this Low Carb Shrimp & Noodles recipe is the perfect substitute for my traditional recipes. Using the recently popular Shirataki Tofu Noodles instead of traditional pasta you can recreate nearly all of your favorite carb laden pasta dishes at a fraction of the calorie and carbohydrate count. The texture is so similar to a traditional pasta you can barely tell a difference and since they are tofu based they take on the flavor of whatever you cook them in beautifully. Shirataki Tofu Noodles are available in most grocery stores near the tofu and are also available online at popular retailers like Amazon in bulk at great prices. On average an entire bag of noodles has less than 30 calories and less than 5gm of carbohydrates for the entire bag. In a large skillet, heat butter, garlic and bell pepper on medium heat and sauteing until bell pepper is just tender. Once bell pepper is tender, stir in white wine and reduce heat to low. Simmer for 5-7 minutes stirring occasionally as sauce reduces. Toss in shrimp and cayenne pepper and cook for 2-3 minutes on each side or until just pink. This meal is not only high in flavor but also low in fat and calories. For those who prefer coconut oil or olive oil could be used instead of butter but we find the calories from using real butter are negligible when considering the dish as a whole and add the nutty flavor needed to expand the flavor profile. When substituting or removing traditional products like the pasta in this Low Carb Shrimp & Noodles dish you always want to make sure you add flavor in another way that will give the satisfying taste you are looking for.